TAS (Arbitration Sport Court) upheld IAAF‘s appeal against RUSADA (anti-doping Russian agency) and stripped the Russian Sergey Kirdyapkin of the golden medal of 50km race walking won during Londra 2012. Having considered too tolerant the penalities and the limits imposed by the Russian agency to its 6 athletes investigated for doping, TAS assigned to IAAF and to the International Olympic Committee (CIO) the task to formalize the transfer of the golden medal London 2012 to the Australian Jared Tallent so that, the silver medal passes to Si Tianfeng and the bronze one to the Irish Rob Heffernan. 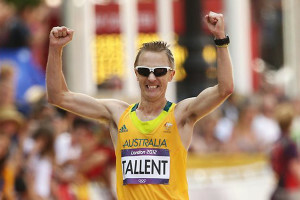 Thus, Jared Tallent obtained the golden medal that was due to him and satisfied said: “History has been rewritten“. History has been rewritten… I am Olympic champion!Thank you to everyone that has supported me in this fight for justice! The Russian anti-doping had banned the investigated athletes but it had chosen the annulment period not modifying the achieved medals. As only answer, TAS cancelled all the performances achieved between 14 August 2009 and 24 December 2012, including the Olympic Games. Another Olympic golden medal that will be reassigned is the 3000st always in Londra 2012, won by Yulia Zaripova. The first place of the podium will pass to the Tunisian Habiba Ghribi, followed by the Ethiopian Sofia Assefa and the Kenyan Milcah Chemos. Moreover, the race walker Olga Kaniskina will lose the silver medal of 20km, Yulia Zaripova the golden one of 3.000m and Sergei Bakulin the 50km race walking. Furthermore, TAS definitively banned two Russian race walkers Valery Borchin and Vladimir Kanaikin. IAAF is grateful to TAS for the work done in regard to the Russian athletes and it stated it will soon modify the results, the classifications and it will transfer all the medals of the competitions under its control.